Holiday Hypermarket admits it is ‘shocked’ at a new survey that reveals a staggering 2.7 million lilos were dumped by Brits while on holiday in 2018. 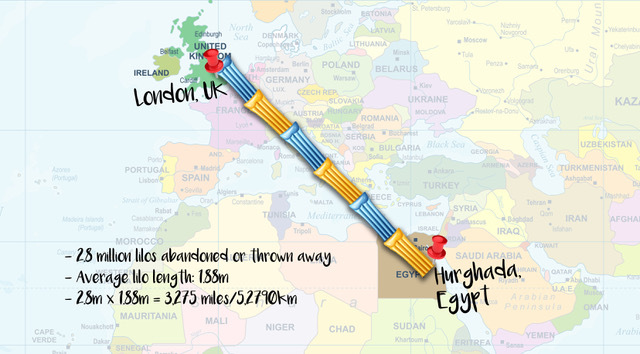 More than 2,000 UK holidaymakers were surveyed in January this year, and the startling statistics show that the discarded inflatables would be enough to build a bridge from London to the popular resort of Hurghada on Egypt’s Red Sea coast. The leftover lilos, averaging 1.88 metres in length, equate to nearly 3,300 miles’ worth of inflatables – and foreign hotels are being left to clean them up. only 13% of these take their lilos home with them. The survey comes at a time where charities such as The Ocean Conservancy and Sea Life Trust have been working to increase awareness of plastic waste, which has resulted in biodegradable alternatives to plastic straws and carrier bags. The results reveal that some UK holidaymakers are contributing to the plastic-waste problem. Before you head out on your perfect getaway, you may be tempted to buy your own inflatable. To reduce the amount of plastic being bought, head to your destination and see if lilos are already provided at the hotel or beach. By doing so, you will help the environment and cut down on costs. The study discovered that 43% of people said they would use a free lilo service if offered by their hotel. Many holiday accommodations now store lilos that have been left behind; if your hotel doesn’t offer this, suggest it to them. Kids love to be involved – take the time to explain to your children why it is important to reduce plastic wastage and not buy a lilo. By involving them in the process, you can work together to find other ways to stay entertained at the pool. Once you’ve finished with your lilo, hand it to another family to enjoy. This means you can reduce the number of lilos being bought by holidaymakers – and share in the holiday fun. Once you’ve finished using your lilo, take it back to the UK for next year’s adventure or send it to accessory specialist Wyatt & Jack. Using plastic waste to make fashionable tote bags, the company will arrange for either a courier to pick up your plastic or refund the postage costs – meaning that recycling is both cost- and hassle-free. With millions of package holidays taken by Brits over the past 12 months, awareness is now more important than ever to protect the environment. Our study shows that UK package holidays contribute towards plastic waste abroad. Recycling and alternatives are the most effective ways to reduce this.